In working with the athlete’s personal brand, appearance is extremely important. In some of my articles, I’ve dwelt a little on how our brain processed appearance. Since this article is not about this, I will say briefly: appearance is priming. We create an estimated judgment about a person on the basis of his/her appearance. Even if it concerns whether a person can be trusted. Tattoos are an opportunity to correctly position a personal brand. For others and for yourself. It must be remembered that a tattoo in sight of the person himself/herself will have a serious impact on his/her actions. A tattoo, whether it’s an image or an inscription, becomes a prism in the surrounding world and the perception of oneself. In which case should I do a tattoo? It is worth noting at once that the athlete’s tattoo (and, in fact, the tattoo of any person) should be carefully considered. The tattoo should begin with the qualitative development of the athlete’s positioning and all accompanying elements. Next, there should be a general plan for covering the body with tattoos. Otherwise, you risk making the wrong tattoo in the wrong place. In the end, you will have nothing to do but to side with the blackwork following the example of Leo Messi. But Messi at least had a normal opportunity to use the blackwork, while Conor McGregor hasn’t acted very farsighted. 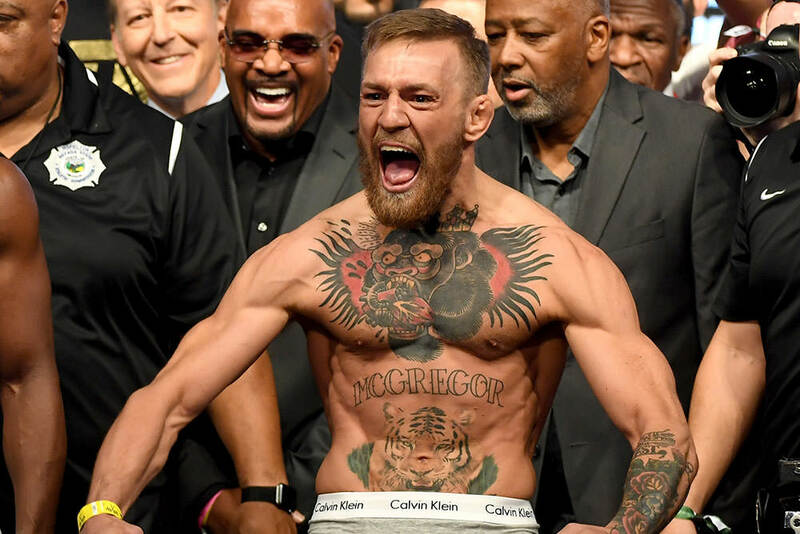 McGregor has a gorgeous tattoo on his chest, which has become a distinctive feature of his brand. What cannot be said about the Irishman’s remaining tattoos. The abdomen area has always seemed strange to me for tattooing for several reasons (the main thing is constant stretching of the skin). But Conor has approached the complementing his torso with tattoos quite shortsightedly. There have been added a tiger and an inscription in styles different from the main tattoo. Now, instead of a claim to style and an image that stands out in a good way, we are facing the MGK’s competitor. What are the rules when choosing a tattoo? Use the rules that can be applied to a conventional design, taking into account the characteristics of our body. 1. Refuse minor details. What looks beautiful in the photos right after the session is unlikely to look the same in a year or two. Even if you care for a tattoo, keep it from direct sunlight (which is not so easy, especially in the summer), our body has not evolved with the purpose not to spoil the tattoo by skin elasticity. I’m quite sensitive to my own tattoos, but the small details on one of them have blended together within the second year already. Yes, there is a certain zest in this, but is it worth looking for? On larger details, it’s much easier to make corrections when the tattoo completely loses its appearance. 2. Refuse the colored tattoos. Otherwise, you risk becoming a regular customer of your tattoo master for color tattoo correction. A color tattoo quickly enough becomes unsightly in appearance. The color black is not only more practical, but also more stylish in case of good performance. As with the first rule, one must keep in mind that the tattoo changes with time. 3. Think well about the need for a tattoo. If the tattoo is not needed for positioning your personal brand (and moreover, if a tattoo hurts it), then do you really need it? Indeed, under the influence of the best masters’ beautiful works, it’s easy to want getting a tattoo. But you’d better first google the number of people who regret their own tattoos. A tattoo for an athlete should be an extremely deliberate and logical decision. In addition to the fact that a tattoo’s healing can adversely affect your training and athletic performance, it carries in itself the functions described at the beginning of this article. A well-designed tattoo can be not only an excellent positioning, but also a key to your motivation. While a poorly designed tattoo can give the opposite result. What type of tattoo is better to choose? The ideal from the neurodesign’s point of view, blackwork isn’t suitable for everyone. Therefore, having violated a few rules I’ve deduced, we can come up with some interesting options. 1. An American traditional tattoo. This is the case when you can afford a little color. The plus of this style is that it is a classic, which won’t go out of fashion in a few years. Certainly, Conor McGregor is the main example of this style with that gorgeous gorilla on his chest. But you can find even more interesting works. Unlike the American traditional tattoo, there are enough good examples performed in black paint. In my opinion, irezumi is best just for those “sleeves”. 3. A blackwork. 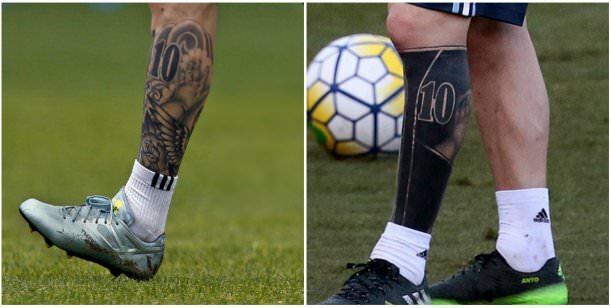 Often, this style is remembered when it is necessary to cover the old bad tattoo (for example, as Leo Messi has done). Covered in black dense color, you will look, at least, original. But a blackwork can carry a certain meaning and have a rather complex form. You can even experiment with negative space. Neurodesign involves the creation of a design based on the simplicity of its processing by the brain. Naturally, it is much easier for the brain to process simpler information, which is exactly what a blackwork carries in itself. As a conclusion, I’ll repeat: do not make hasty decisions that can harm your personal brand. The peculiarity of tattooing in building the athlete’s personal brand is that it should be his/her assistant, not an enemy. Do you need help in building a personal brand? Write at Email leon@sportsneuromarketing.com, and we will reply to you within 24 hours.